A garden was created by Marcelino Esquilin in the vacant lots behind their house. He kept a garden for nearly 40 years before dying six months ago. Then the property was sold at a sheriff's sale before they knew it. When Marcelino Cartagena was a kid, the empty lots behind his house were brimming with peril. People gripped with heroin addiction, by the ’80s already an epidemic sweeping through the neighborhood, would shoot up back there, leaving the ground scattered with needles like an evergreen forest. The rusting carcasses of abandoned cars would appear, all manner of tires and trash. Cartagena, of course, couldn’t stay away. Philly's urban gardeners are under siege from gentrification. Here's what they're doing about it. It was to protect his kids that his father, Marcelino Esquilin, began cleaning up the lots on North Palethorp Street, in a section of North Philadelphia near Kensington. He put up fences and “no trespassing” signs. In the subsequent four decades or so, he transformed the lots into a ramshackle, but safe, haven. He planted peach and apricot trees, cultivated grape vines, sowed eggplant and vianda, a starchy tuber. “His plan was to utilize it in a way that not only he benefits from it but the neighbors benefit from it,” Cartagena said. His father would run informal workshops for neighborhood kids, share produce with passersby, buy fencing from scrappers, and hire those who were struggling to help with the yard work. 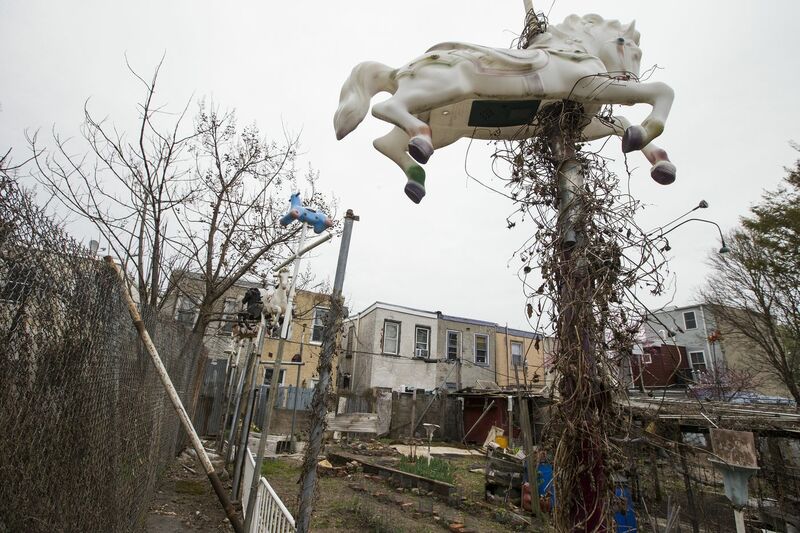 It became an eccentric neighborhood landmark, known for its carousel horses planted high up on posts, like sentries. Esquilin died six months ago, leaving unfinished the business of seeking to safeguard his life’s work. He never knew that three of the four plots that make up the garden had already been sold at sheriff’s sale. Now, Cartagena and pro bono legal advocates are arguing that the city and its tax collector never posted notice on the property as required by law — and that Philadelphia Common Pleas Court is not holding sufficient hearings to review whether the city is fulfilling its obligation to notify all interested parties. If they can get the sale vacated, they’ll argue that the family has the right to own the garden through a rarely invoked law around adverse possession, that says after 21 years of openly squatting on a property, a person can earn the right to own it. A garden was created by Marcelino Esquilin, pictured, in the vacant lots behind his family's house. He kept a garden for nearly 40 years before dying six months ago. Now the property has been sold at sheriff's sale. Benjamin Picker, a lawyer for Cartagena, wrote to the court in late March arguing the court’s hearings violate the due-process rights of interested parties. If no one shows up to oppose the city at the hearings — which are, after all, to verify that anyone who would want to oppose it was notified in the first place — they typically last less than a minute, and consist only of lawyers passing up paperwork to a court official for approval. The city and the court both disagree; they say their current hearings are adequate. In fact, after a series of sales were reversed by higher courts because of the failure to hold adequate hearings to verify all parties had been notified, the First Judicial District worked with the city, Community Legal Services, and other legal aid providers to overhaul how it held these hearings in 2017. After that, the courts began requiring photos to prove notice had been posted before a property could be sold. Cat Martin, co-director of Community Legal Services’ tax team, said the new process is a vast improvement, especially given that, before 2017, many properties were sold at tax sale with no hearing at all. It’s resulted in far fewer people coming to CLS for help after their properties have already been sold — even as the city increased the number of properties it was bringing to tax foreclosure by 1,200 percent as part of an extensive and highly successful tax collection effort. But those cases do still occur from time to time. In some instances, the homeowner never saw the notice of impending sale because he or she was in the hospital, or otherwise indisposed. “What we have argued actually is that personal services is required —that’s what’s required in mortgage foreclosures if a bank is going to take someone’s property," Martin said. The properties that make up Cartagena’s garden, on North Palethorp Street, were approved for sale after the court’s new rule was published, but before it took effect, according to the city. There are no photos in the docket to prove notice was posted on the property, just an affidavit by a process server swearing that it was. A garden was created 40 years ago by Marcelino Cartagena's father, Marcelino Esquilin, in the vacant lots behind their house. Now the property has been sold at sheriff's sale. Cartagena shows the irrigation system his father ran through a grapevine arbor. But it might not be Cartagena’s garden for long. Justin Krik, a lawyer for buyers of two parcels, said the sale is valid and he has already filed actions seeking to eject the gardeners from the property. He said he could not provide any information on the owners’ plans for the property. And, he said, he’s not sure if the buyers were aware that there was a garden on the site. “I’m not sure that it’s relevant,” he said. Mike Dunn, a city spokesperson, noted that the property had not been identified to the city as a garden. “If it were set up as a community garden, it would be tax-exempt rather than tax delinquent,” he wrote in an email. If Cartagena can fight being ejected from the property and get the sale set aside, he still faces a long and uncertain legal battle to gain possession. For now, he is moving forward with the annual spring cleanup, trying to do everything just as Esquelin used to do.